War isn't very pleasant, and watching men prepare for war wasn't very pleasant either. It wasn't that Outlander Season 2 Episode 9, was boring, it was just very...tedious. With only four episodes left to the season, it makes sense that one this was more of a filler. Maybe you could just call it the calm before the storm. It can't be fun knowing what the future may hold. Trying to stop the rebellion via Paris was a complete failure, so having to train these men and not think about the possible horrific conclusion has to be very stressful for both Jamie and Claire. Failure is not an option this time around. This time, failure means death. And these thoughts are the very thing that seems to be triggering Claire's flashbacks (or flash forwards, if you will). At first, I wasn't sure why there were so many. Every single thing she did or saw was causing her to remember her time during World War II. I can't imagine having gone through what she did, laying in that ditch, listening to a young soldier scream out for his mother. It would definitely haunt me, too. Still, it seemed like these scenes were almost forced into the story to give Claire something to do this hour, because otherwise why wouldn't she have remembered these earlier? Certainly there have been events prior to this that would have triggered these memories. If I go back, it'll be just like lying in that ditch again, helpless and powerless to move like a dragonfly in amber. Sometimes, Claire just gets on my nerves. There was no reason for her to have pulled Fergus away from playing stickball with the soldiers. Once those flashbacks started, they certainly weren't just going to go away, so did she really think stopping Fergus would make them disappear? And how is it that she always knows what to do any time there is some sort of situation at hand? During Outlander Season 2 Episode 8, she pretended to have a vision, and this time around she pretended to be a hostage. Each time, she always gets what she wants. Is Claire really that clever, or is it just a clever plot device? Sorry, Jamie, but there is nothing "selfless" about Claire. How can he even say that after the events of Outlander Season 2 Episode 5? Sometimes, I wish she would just fail. Like big time fail. Like maybe Laoghaire would have a night with Jamie kind of fail. Yes, I actually wrote that. It was sort of ironic what Claire said to Dougal about narcissism. Granted, he deserved her tongue lashing, but couldn't everything she said to him be said about her? Let's get one thing clear, Dougal Mackenzie. If I ever thought of you, then I might hold a grudge for all the things you've done to me. But, I don't. Why? Because of your affliction, your inability to be selfless, because you suffer from narcissism. While Claire was showing off her cranky, Jamie was dead serious in regards to getting his men ready for the upcoming war. Murtagh was hilarious trying to be a drill sergeant to the motley crew of men assembled to take on the British army. 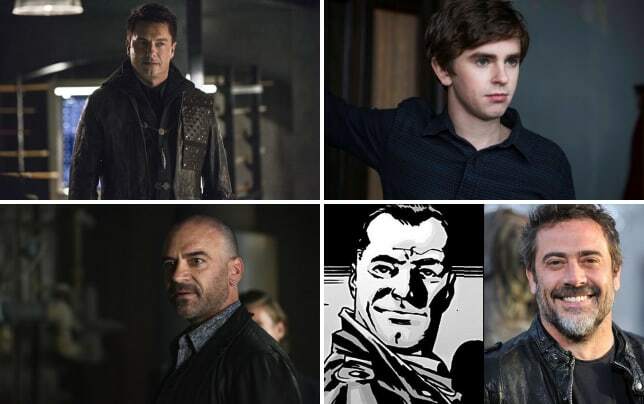 But it's not really funny what may happen to these men if Jamie and Claire's hopes don't come to pass. I honestly can't see how these men are going to be able to win against the British. 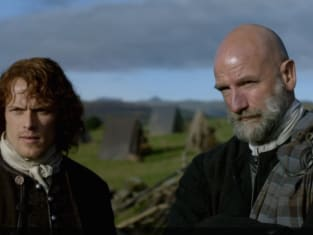 Hopefully, Prince Charles has more capable trainers than what Murtagh and Dougal had to offer, otherwise it's going to be one big bloodbath for Clan Fraser. What did you think of "Je Suis Prest"? Share your thoughts in the comments below. If you need to catch up, you can watch Outlander online right now via TV Fanatic! Fergus: It's been horrible. He forced me to mend his socks and to fetch his meals. Murtagh: I'm just trying to educate the lad on the finer points of travelling in the Highlands. Permalink: I'm just trying to educate the lad on the finer points of travelling in the Highlands. Dougal: I think I know a wee bit more about this than you do. Permalink: I think I know a wee bit more about this than you do.